Galvatron is a cold-hearted robotic villain. Determined to lead the Decepticons. Possesses enough strength to pulverize an Autobot into scrap metal. Unconquerable. Arrogant and compassionless. Plots against his allies, thus weakening his position. In robot mode, he carries a laser that emits chemically-produced, direct-current electricity. "Total victory requires total destruction." Doesn't stop blasting until he's hip-deep in smoking rubble. Completely without mercy. 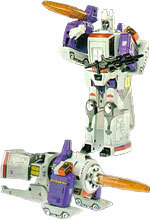 The most lethal fighting machine devised by the Decepticons. In dinosaur mode, jumps 20 miles with rocket backpack. Shoots heat-seeking plasma bombs from mouth and mind-controlling hypno-beam from optical sensor. As city, has landing and repair bays, communications center and rotating scanners. In mobile station mode, has laser cannon, rotating blasters, destructo-beams and dual photon launchers. "Compassion is the Autobots downfall." Cyclonus is huge and emotionless air warrior. He has vast resources of power and can draw strength in direct proportion to his need. Cyclonus is equipped with nuclear-powered turbine engines which enable him to reach speeds greater than Mach 2. In robot mode, he carries an oxidating laser that fuses an enemy robot's internal mechanisms. Cyclonus has no weaknesses and no interests other than conquest. Scourge is fearsome, merciless and implacable hunter. Created from Decepticon wreckage, he leads "The Sweeps", a wolf pack of tracker-terminator's designed to hunt down and eradicate Autobots. Scourge possesses powerful high-tech scanning equipment and a disintergater ray that can cut through solid rock. In robot mode, he carries a laser blaster that shoots short bursts of intense heat. Scourge's only weakness is his arrogance.